Websites are littered with “star ratings” these days; but are they worth it? Do visitors take any notice of them? With so many websites including such star ratings, surely they must be worthwhile? After all, if everybody is doing it, then it must be good – right? Well, perhaps not. Rating stars do appear to have some value, but they are not as good as written reviews. Indeed, according to research from the University of Mainz, a single written review can be more influential than a cumulative rating. 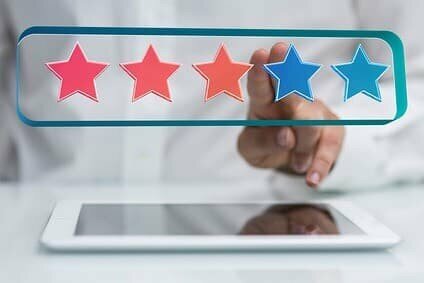 The study found that aggregated star ratings are much less of an influence on a website visitor than a written review. Indeed, the researchers were able to demonstrate that a written review had more impact on potential purchasers even if they accepted that the reviewer was not typical. In other words, people who visit your website trust the words more than they trust the stars. Other studies have found, for instance, that it is not the “average” that matters, but the extremes. It appears that people tend to look at the highly negative reviews and the entirely positive ones, making their own assessment of what those extremes mean. Such research was recently highlighted in the article, “3 Psychological Tips to Make Customer Reviews Work“. So, what do these studies mean for your website? They suggest that you need to garner written reviews and testimonials, rather than just ask people to rate you. Indeed, according to the German research, the star ratings are influenced entirely by what you think of the company’s customer service anyway. So if you perceive the company as having poor customer service, the five-star rating is less likely to be worthwhile. That suggests that a business needs excellent customer service if it is to benefit from online star ratings. Otherwise, they are too open to influence from what people think about you. That is not the case for written reviews, it seems. So, the more written reviews and testimonials you can gain, the better for your business. However, yet more research from Germany shows that the key to the effectiveness of written reviews online is the strength of the brand. The study found that the responses to written reviews influenced the likelihood of purchase, when such reviews were negative. One of the most important factors affecting the impact of such responses to negative reviews was the strength of the brand itself. In other words, if you want to benefit from written reviews, you need to establish your business as a reliable brand. Combined with the fact that earlier studies have found that what influences star rating value is what people already think about your company, a clear message is coming through from the research. Star ratings and online reviews are only really worthwhile if you run a good business. Concentrate on providing quality products and excellent service and your ratings and reviews will have value. But avoid providing the best you can, and those online reviews will be of little real value to you.